A group of 12 people paddled the Kishwaukee on Sunday from Baumann Park to 1 mile or so past the Hy 39 bridge. Harriet and Doug let the trip and here is Harriet's write up. The weather was a little sketchy at the beginning, buy the time we shuttled we had glimpses of sunny blue skies. The water level was good, the weather broke into a sunny, breezy day. We were treated to a eagle flying directly overhead carrying his sushi lunch. Turtles, catbirds, & kingfishers were abundant and a goldfinch were all spotted by the group. Harriet & Don got some surfing in. Tom took a dip at lunch & worked his roll at take-out. The Elderberry bushes were in full bloom. After the paddle most went out to enjoy some ac and a cold drink at a local establishment. Thanks to our old & new friends who shared the Kish with us for a great day on the water. We had beautiful weather in Wisconsin last weekend for the final beginner trip of the year. The water was running a little high and warm (70). We had 8-9 beginners on the two day trip although several students was their 2nd year on this trip. We had 4 NEW paddlers who really put themselves out there and ran everything! Jennifer, Jeff, Mike and Al (NEW 4) all had great attitudes and coached each other on. Saturday we did Wolf River Section 3. The water was at about 525 CFS which covered a lot of the rock and made things a bit easier. This was the first time on a true whitewater river for the NEW 4 and it was a long day as we had 15 paddlers in the group. There were several swims and people learned the importance of hitting eddies high, ferrying and avoiding the holes we just spent 20 minutes pointing out:-). We'll work on bracing next. 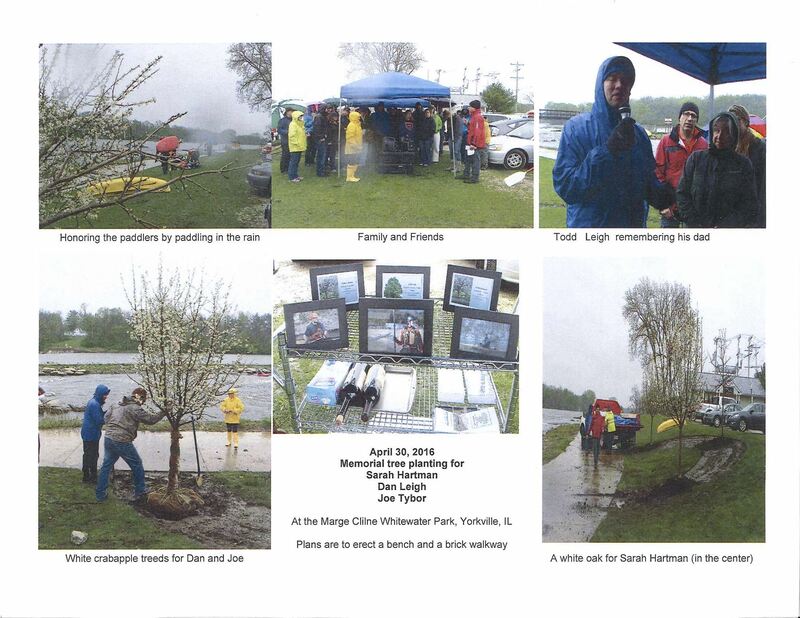 There was a Memorial Tree planting for Sarah Hartman, Joe Tybor and Dan Leigh on Saturday April 30th at 11:00am. Location is 301 E. Hydrolic Ave. Yorkville, IL. Many friends and family came and help plant the trees and show support to these wonderful friends, instructors and paddlers who lost their lives to cancer last year. In March CWA members hosted the Reel Paddling Film Fest and the proceeds were to go to American Whitewater who works on river stewardship activities throughout the United States. The film fest was a huge success and CWA donated the $1100 to AW. 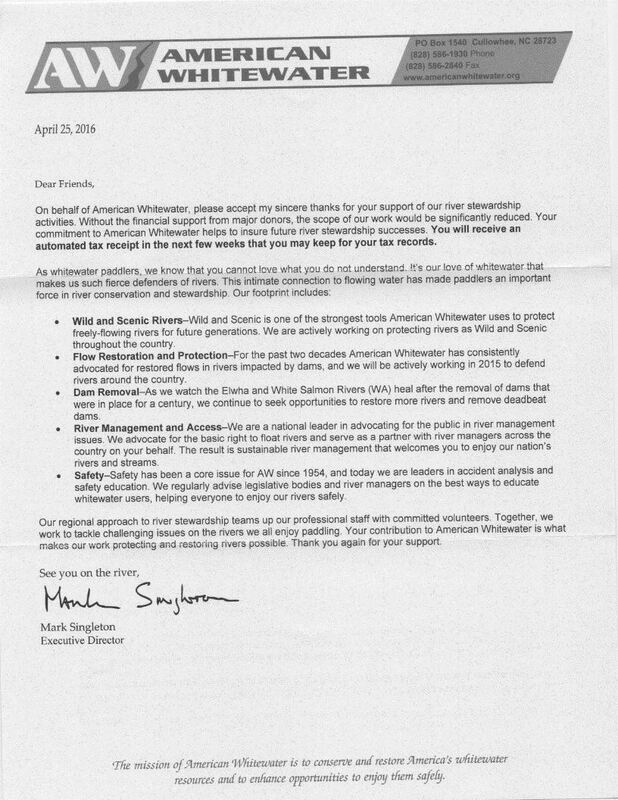 Attached is the thank you letter from AW.